A New and Accurate Map of Portugal. 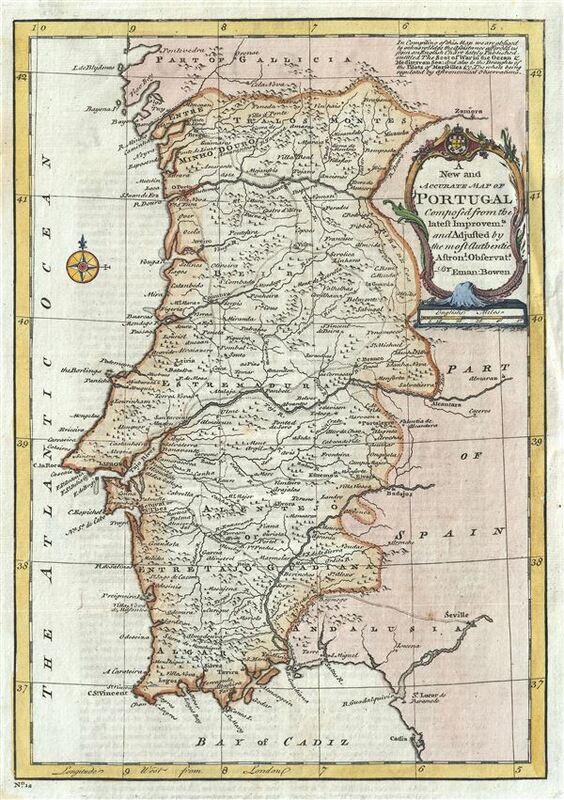 This is a beautiful 1747 map of Portugal by the British cartographer Emanuel Bowen. Centered on the Tajo River, it covers all of Portugal, noting several towns, cities, rivers, lakes, roads and a host of additional topographical features are noted throughout, with mountains beautifully rendered in profile. A beautiful title cartouche is included in the top right quadrant. This map was prepares by Emanuel Bowen as plate no. 12 for the 1747 issue of A Complete System of Geography. Very good. Original platemark visible. Blank on verso. Minor offsetting.